Click image to enlarge Rooster Rock, Oregon. View from Tunnel Point, off of Interstate 84, Portland, Oregon. Image taken October 10, 2004. Rooster Rock is a large basalt feature located on the Oregon side of the Columbia River at River Mile (RM) 129, just below the base of Crown Point. 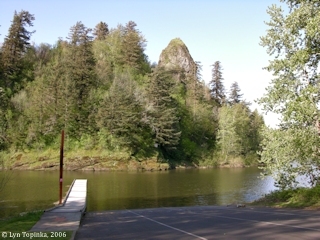 Rooster Rock is located downstream of Shepperds Dell and upstream of Tunnel Point, Oregon. 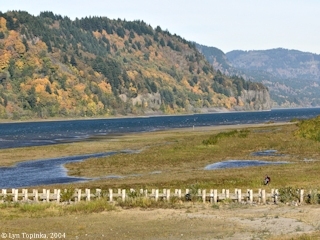 Across the Columbia are located Steigerwald Lake National Wildlife Refuge and Point Vancouver, the farthest upstream visited by Lieutenant Broughton in 1792, a member of the Captain George Vancouver expedition. Cape Horn and Beacon Rock both lie upstream on the Washington State side, and the famous Multnomah Falls lies upstream on the Oregon side. Lewis and Clark camped near Rooster Rock on November 2, 1805. Rooster Rock is a landslide of Crown Point intracanyon fill. 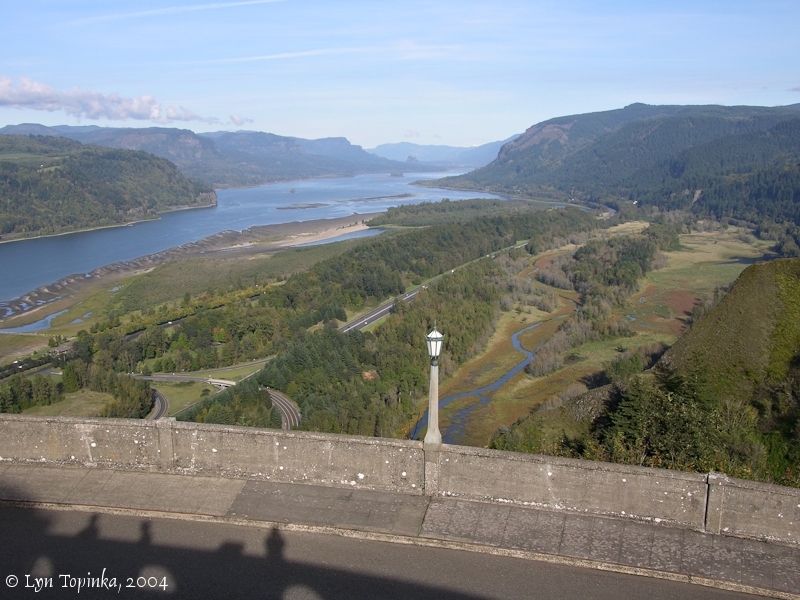 The scar where the slide came from is visible on the cliff above and the Historic Columbia River Highway runs along the headscarp. Rooster Rock itself is a spire from the Crown Point entablature. 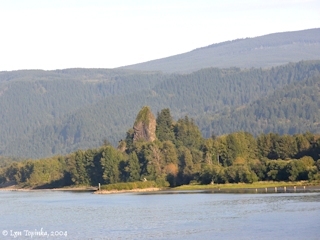 Click image to enlarge Rooster Rock and Crown Point. Rooster Rock and Rooster Rock State Park are at the base of Crown Point, as seen from Interstate-84, Oregon, Tunnel Pullout. Vista House is just visible perched on top of Crown Point. Image taken October 10, 2004. 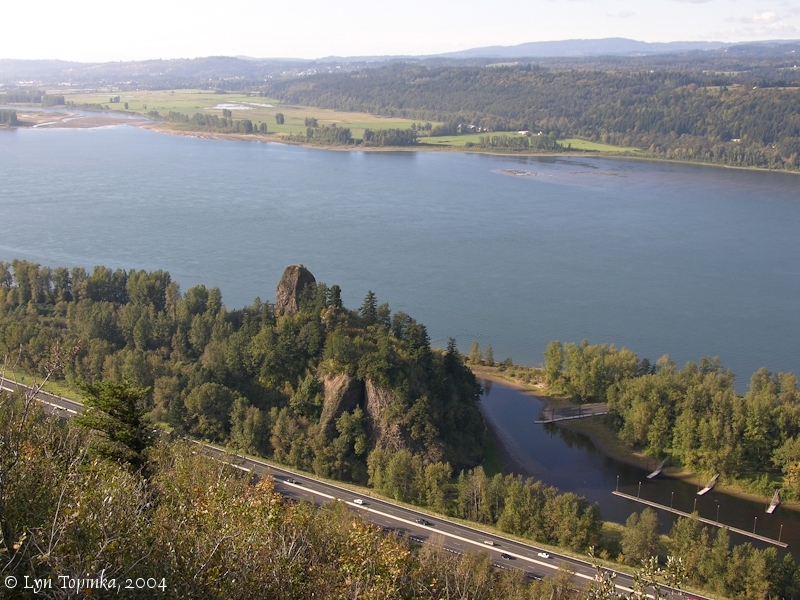 Lewis and Clark's campsite of November 2, 1805 was near Rooster Rock and Crown Point. 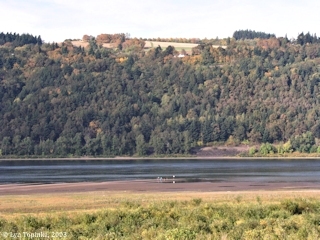 Lewis and Clark's previous campsite was upstream on the Washington side of the Columbia River near Fort Rains. The campsite of November 3, 1805, was on Government Island. 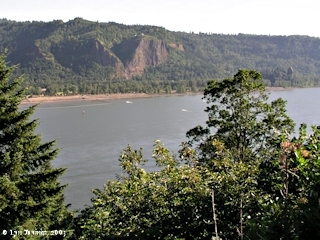 Click image to enlarge Rooster Rock and Rooster Rock State Park, from Crown Point, Oregon. Rooster Rock and Rooster Rock State Park are at the base of Crown Point. 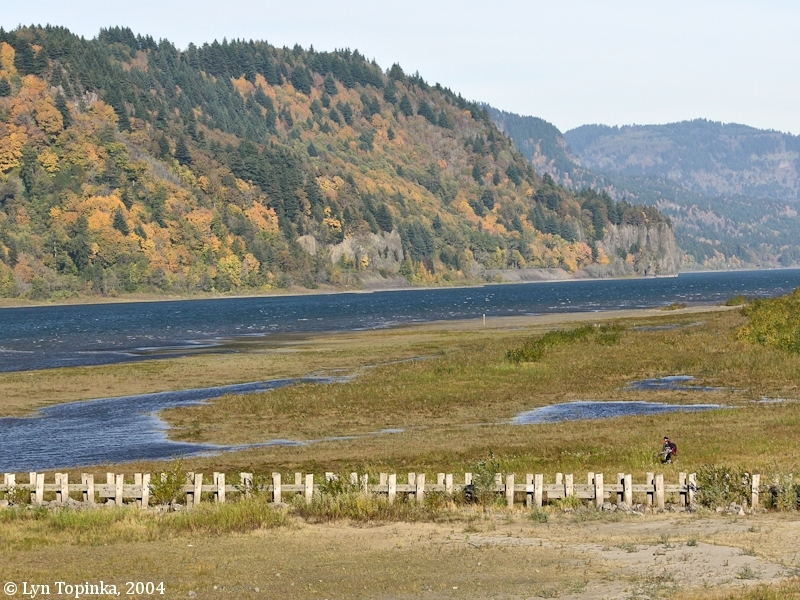 Steigerwald Lake NWR and Point Vancouver are across the Columbia on the Washington side. Image taken October 10, 2004. Rooster Rock State Park is located along the Columbia River, 22 miles east of Portland, Oregon. The park features picnic spots, hiking trails, and 3 miles of beaches. Lewis and Clark's campsite from April 6 through April 8, 1806, was in the Rooster Rock State Park area, at Shepperd's Dell. Click image to enlarge Rooster Rock State Park, Oregon, and Young and Latourell Creeks. From Crown Point looking upstream at Rooster Rock State Park. Latourell Creek (right) and Young Creek (left) meander through the foreground. Shepperds Dell is to the right off of Young Creek. Young Creek, once leaving the Shepperd's Dell area, flows westward through Rooster Rock State Park, where it merges with Latourell Creek and forms Mirror Lake, which then merges with the Columbia River just below Rooster Rock. Image taken October 10, 2004. "In our regional nomenclature place names of Indian origin are many. They are of special aptitude in most instances, and particularly to the natural objects about which hover a wealth of traditional reminiscence and mythical lore. This, it seems, should not be entirely lost or forgotten. The ancient name "Woutoulat" is preferable to Rooster rock. The one is redolent of the old time myths, and the religious symbolism that reaches back to a time anterior to the traditions, while the other serves no purpose, outside of being a mere name, the unsuitableness of which invariably calls forth the query, "Why?"." Source: H.H. Riddell, 1916, "The Lesser Waterfalls Along the Columbia", IN: Mazama, vol.5. Lewis and Clarked camped at Rooster Rock on November 2, 1805, and called it a "high projecting rock" and a "high peak resembling a tower". In 1841, Charles Wilkes, of the U.S. Exploring Expedition called Rooster Rock the "Obelisk" on his map "Sheet No.6 of Columbia River". He also had Tunnel Point labeled "Square Rock" and Reed Island called "Vancouver Island". In 1872 Mrs. Frances Fuller Victor used the name "Crow's Roost" in her publication "All Over Oregon and Washington" ... (p.77-78). According to Oregon Geographic Names (McArthur & McArthur, 2003), : "The modern name is of phallic significance originating from rhyming slang. ", however in 1896 Emma Adams wrote about the Rooster Rock name (see below). A post office called "Rooster Rock" was established in May 1876, but changed to "Latorell Falls" in August 1887. Emma H. Adams wrote about passing Rooster Rock in 1886 while on the steamer "Dixie Thompson" in her publication "To and Fro, Up and Down, in Southern California, Oregon, and Washington Territory ...". "... [p.327] Leaving Vancouver, the Thompson soon approached the point where the river emerges from its grand gorge in the Cascade Range, and before noon we had a stupendous scenery on either side, nearly every mile contributing some object of special interest. 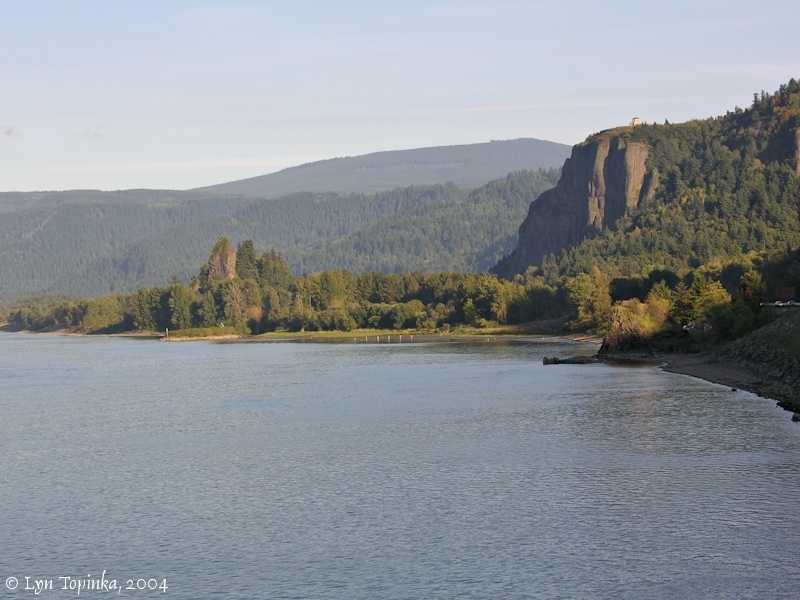 'Do you see that lofty rock rising out of the water, just ahead, on the Oregon side?' asked the purser, a young man from Chicago, as we turned away from Vancouver. The 'marvel' is a column of dark basalt, of irregular conical shape, resting on the bed of the river sixty feet below the surface, and rising probably one hundred and fifty feet above the surging water. The powerful current must have spent ages in hewing the staunch shaft into its present shape. 'Looks it like a rooster?' No. It has not the slightest resemblance to one, but the top offers an admirable place from which to crow, could Mr. Gallus but reach it. Near by is another mass of rock, which answers very well for a hen, and scattered about are smaller ones, very suitable for chickens; thus is the spot supplied with a while family of the domestic fowl. ..."
Source: Emma H. Adams, 1888, "To and Fro, Up and Down, in Southern California, Oregon, and Washington Territory ...", Cranston & Stowe, Cincinnati, Chicago, and St. Louis. Rooster Rock State Park is located along the Columbia River, 22 miles east of Portland, Oregon. The park features picnic spots, hiking trails, and 3 miles of beaches. 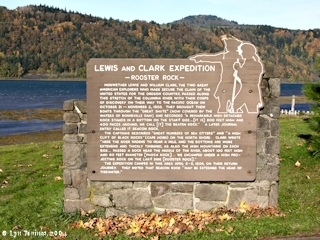 Click image to enlarge Rooster Rock, Lewis and Clark sign at Rooster Rock State Park. Image taken November 4, 2004. Click image to enlarge Rooster Rock State Park, Oregon. View looking east. Image taken April 24, 2006. Click image to enlarge Boat ramp, Rooster Rock State Park, Oregon. Image taken April 24, 2006. Click image to enlarge Crown Point, Rooster Rock, and Rooster Rock State Park. Rooster Rock and Rooster Rock State Park are at the base of Crown Point. Image taken June 25, 2003. The Rooster Rock Cannery once existed on the west side of Rooster Rock in the small bay between Tunnel Point and Rooster Rock. The Cannery was built by Antone Fastabend for Samuel Elmore, who had a large Cannery business in Astoria, Oregon. Because of constant silting of the bay where the cannery was located, it eventually was forced to move to Ellsworth on the Washington shore. Click image to enlarge Penny Postcard: Rooster Rock, Oregon, with Cannery ca.1905. Penny Postcard, ca.1905. "Rooster Rock, Columbia River, Oregon." Note fishwheel along side of Cannery. Published by B.B. Rich, Official Stationer. Undivided Back. In the private collection of Lyn Topinka. Rooster Rock Cannery to Move. VANCOUVER, Wash., Nov.3. -- (Special.) -- The Rooster Rock cannery for salmon is to be removed to a site on the W.X. Morgan place on the Columbia River just above Ellsworth, it is reported, and men already are at work making preparations to build the cannery. The machinery will be shipped down the river and put in this cannery. It is said that the building will cost from $6000 to $10,000 and that the Change is made desirable by the changing sands near the old cannery." Source: "The Morning Oregonian", November 4, 1916, courtesy University of Oregon Historic Newspapers Digital Archives, 2015. 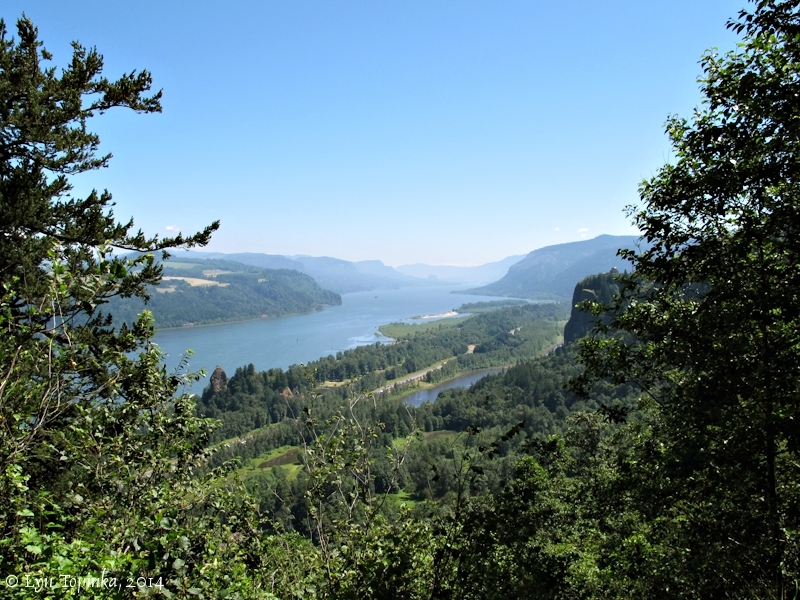 "Rooster Rock is a "minor" state park that has not, up to this time, been directly identified with the Columbia Gorge series. It is siturated near the river level and entirely away from the present highway, lying below, and a short distance west of Crown Point. It is described as being in Section 25, Township 1 North of Range 4 East, W.M. and in Section 30 of Township 1 North of Range 5 East, W.M., in Multnomah County, containing 33.63 acres. Its principal physical feature is a tall, shapely, basalt monolith, long known as a prominent land mark. 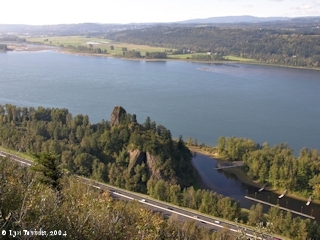 In his Oregon Geographic names, page 301, Lewis A. McArthur, says: "This is probably the rock mentioned by Lewis and Clark as their camping place on the night of November 2, 1805". If this site could be definitely, or even approximately determined, it would be quite appropriate to erect a marker at the designated place. 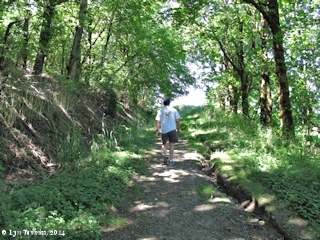 The tract was acquired by purchase on February 26, 1938, for right of way for the proposed river grade highway. It lies between the railroad and river and there are no park improvements of any kind, up to this time." ." W.A. Langille, State Parks Historian. "Recommendations will be submitted after a thorough survey has been made." S.H. Boardman, State Parks Superintendent, March 25, 1946. Source: W.A. Langille and S.H. Boardman, 1946, State Parks Historical Sketches: Columbia Gorge State Parks, courtesy of Oregon State Archives website, 2014. Rooster Rock State Park is located 23 miles east of the city of Portland, on the Columbia River Highway (Interstate 80N), near the west entrance to the Columbia River Gorge in Multnomah County. 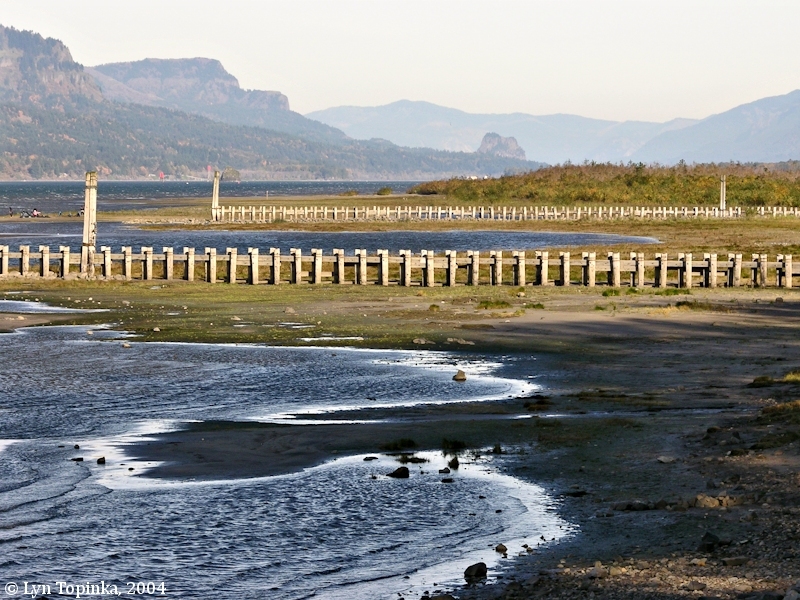 The Union Pacific Railroad tracks and the Columbia River form the boundaries of the park. 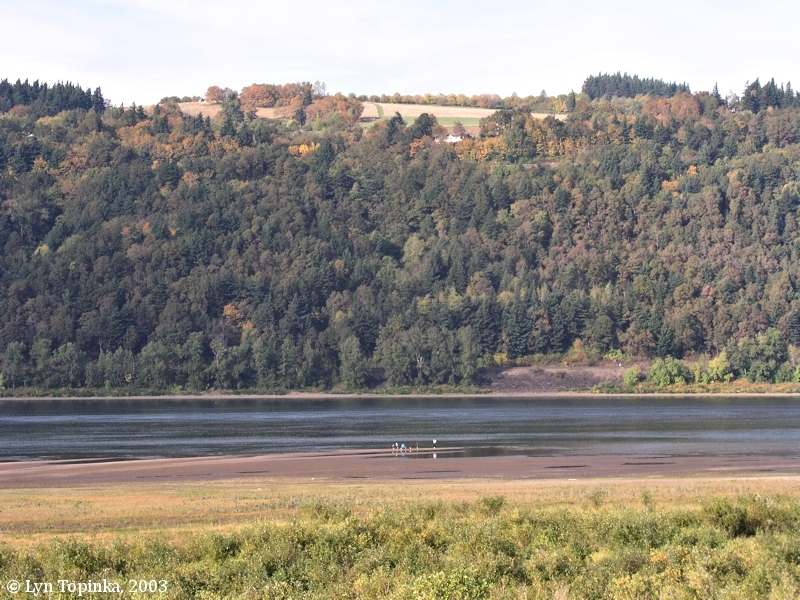 The first area acquired was 54.38 acres of overflow land lying below the meander line of the Columbia River. It was obtained from the State Land Board at a cost of $271.90 on June 8, 1937. There were seven other land purchases ranging in size from 17 to 280 acres at costs from $410 to $9,000 for the tracts. These properties were acquired with highway rights of way between 1937 and 1946. 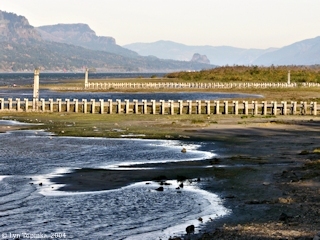 The land had been used in connection with a fish seining and canning industry on the Columbia River. An exchange of land was completed in 1954 whereby Fritz Luscher was given 12 acres from the southeast corner of the park and the state received 6.25 acres of timberland at Shepperd's Dell State Park. The total acreage in Rooster Rock State Park was 812.65 acres at the close of 1963. The area was obtained to provide a swimming beach and picnic area and to promote boating interests that could be developed. 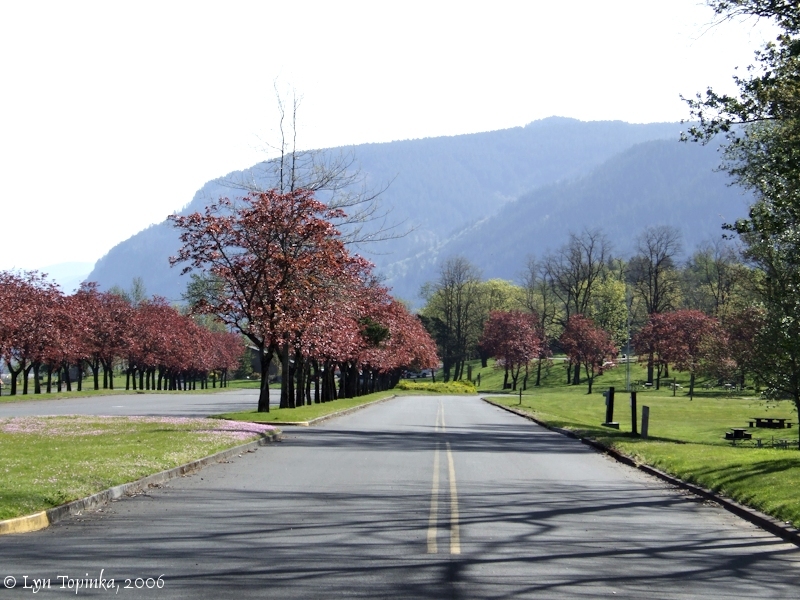 The views of the Columbia River and the canyon walls are good, the walls displaying an evergreen coat throughout the year and an occasional splash of white when the dogwood trees are flowering. The terrain is low and a great portion of it floods during extremely high water periods. The waters from Young Creek and Latourell Creek form a lake between the highway and the railroad. The higher lands within the park are covered with maple, alder, willow, cottonwood and various other species of native shrubs. 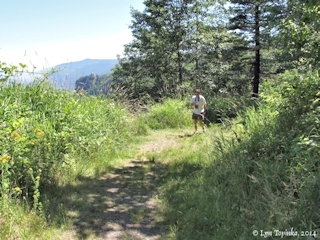 Rooster Rock State Park has slightly more than three and one-half miles of frontage along the Columbia River. This long, sandy, gently sloping river frontage furnishes a dune-like playground and an excellent swimming beach for park patrons. The rock itself is a tall, columnar, basaltic spire rising to a height of several hundred feet. It is located near the west end of the park and serves many river boatmen as a guide mark. It attracts the eye of the artist, geologist and rock climber. The rock, with its 28.54 acres of surrounding land, was acquired in 1938 at a cost of $10,000, 75% of which was charged to the park. Rooster Rock State Park was named after this tall, shapely monolith. 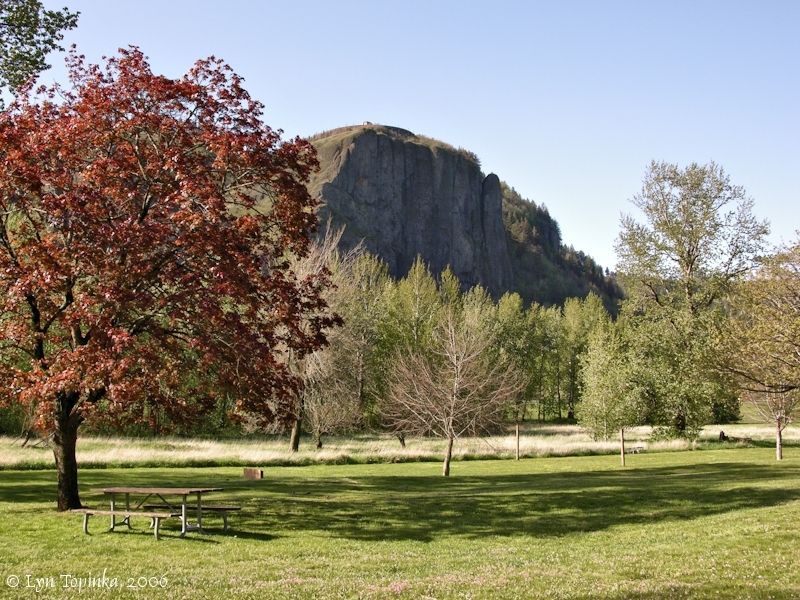 This area has a direct connection with history, as Lewis A. McArthur in his Oregon Geographic Names say about Rooster Rock: "This is probably the rock mentioned by Lewis and Clark as their camping place on the night of Saturday, November 2, 1805." To further substantiate its connection with history, Universal Picture Corporation obtained authority on August 3, 1951, to utilize an area at Rooster Rock to film a historic picture relating to early travel in the settlement of the west. Plans for an entrance road, including a traffic interchange, and construction of park facilities were ordered by the Highway Commission in August, 1955. The contract was completed in 1956 and dedication of the park was on July 25, 1957. The Portland Chamber of Commerce and Visitors Service Committee were instrumental in the dedication program. In order to obtain drinking water for the park, a contract was entered into with the Corbett Water District to tap its lines near the Vista House high on the hill to the south of the park. 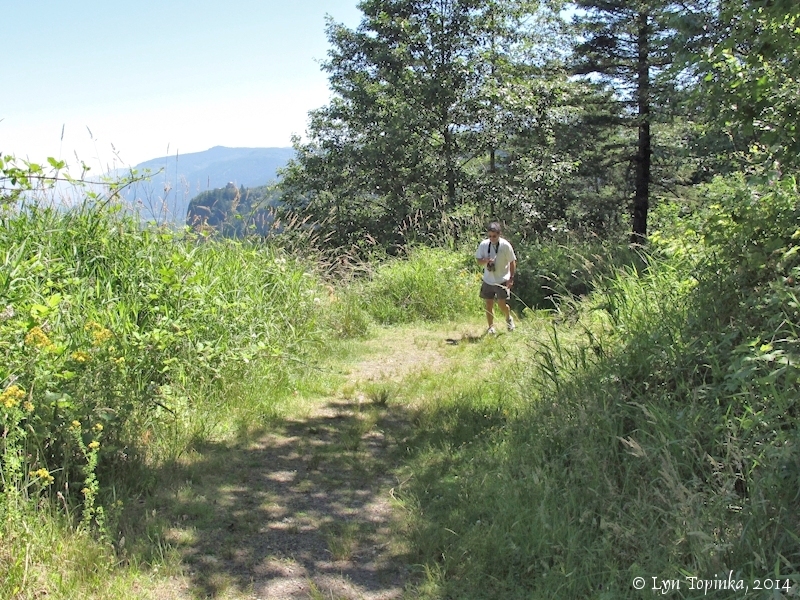 In connection with this work, two easements were obtained in order to cross lands near the Vista House. 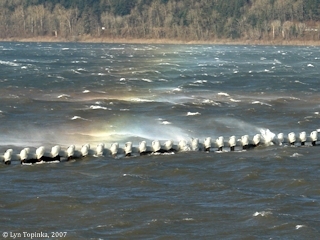 Latourell Creek channel from near Rooster Rock to the Columbia River, a distance of approximately one-half a mile, was dredged to a depth of four feet and width of 40 feet to accommodate small boats. Provision was made for a paved boat launching ramp 40 x 100 feet. 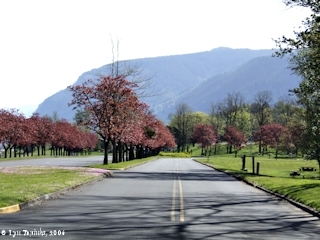 The Multnomah County Sheriff reported that there was heavy traffic into the park almost daily and on Sunday, July 28, 1957, there were 10,836 visitors. Lifeguards were placed in the park and six loud speakers have been properly placed and connected to the police office located in the concession building. One of the so-called walkie-talkie radios was given to each lifeguard. A telephone booth was placed in the park near the concession building. Two bids for leasing 72 acres of grazing land between the highway and railroad tracks were received by the Commission on January 16, 1958. The successful bidder was Multnomah Falls Gift Shop at an annual fee of $505.50. The lease ran for five years and was not renewed. A large concession building was built in 1956 to accommodate the concession facilities, lavatories and baths. It also provides office space for the police force. Bids were called for operation of the concession and P. & A. Enterprises was the high bidder. A lease was entered into on March 27, 1958, at 20% of the gross take. In 1960 P. & A. Enterprises became dissatisfied with the lease and demanded that the rate be reduced. The Commission, not wishing to revise the lease as requested, cancelled it in September, 1960. A new agreement was entered into with Otha Jones of Portland under the same terms after again having called for bids. Improvements consist of entrance road, curbed parking area ample for 3,000 cars, picnic areas with many tables, benches, electric stoves and water, trails, four sanitary facilities, swimming beach, concession building with shower baths, toilets and space for the police office, boat launching ramp and boat trailer parking space. Approximately 1,000 lineal feet of shore line was protected with riprapping. Attendance during 1963 was 319,936 day visitors. Overnight camping facilities have not been provided." Source: Chester H. Armstrong (compiler), 1965, "History of the Oregon State Parks: 1917-1963, published by Oregon State Parks. The Rooster Rock to Chanticleer Road, also known as the "Rooster Rock Wagon Road", started at the railway station at Rooster Rock (near the Cannery) and wound it's way up the basalt cliffs to the Chanticleer Inn at Chanticleer Point. Today this is the location of the Portland Women's Forum Scenic Viewpoint. Patrons of the Inn would arrive at Rooster Rock by boat or train, and then walk or ride up the steep, unpaved road. Click image to enlarge Rooster Rock to Chanticleer Road, Portland Women's Forum Scenic Viewpoint, Oregon. View of Road less than 0.1 mile from trailhead at Chanticleer Point, with Vista House and Devil's Rest in the distance. Image taken July 7, 2014. Click image to enlarge Rooster Rock to Chanticleer Road, Portland Women's Forum Scenic Viewpoint, Oregon. View of Road approximately 0.13 miles from trailhead at Chanticleer Point, with Vista House and Devil's Rest in the distance. Image taken July 7, 2014. Click image to enlarge View, Rooster Rock to Chanticleer Road, Portland Women's Forum Scenic Viewpoint, Oregon. First "viewpoint", about 0.13 miles downhill from trailhead at Chanticleer Point. Image taken July 7, 2014. 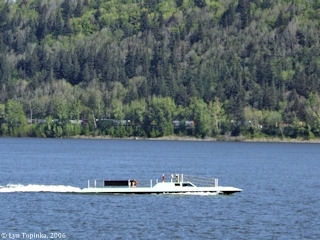 This U.S. Navy SEALS "stealth boat", designed and built by Oregon Iron Works in a design called "the Alligator" was spotted on April 24, 2006, from Rooster Rock State Park. 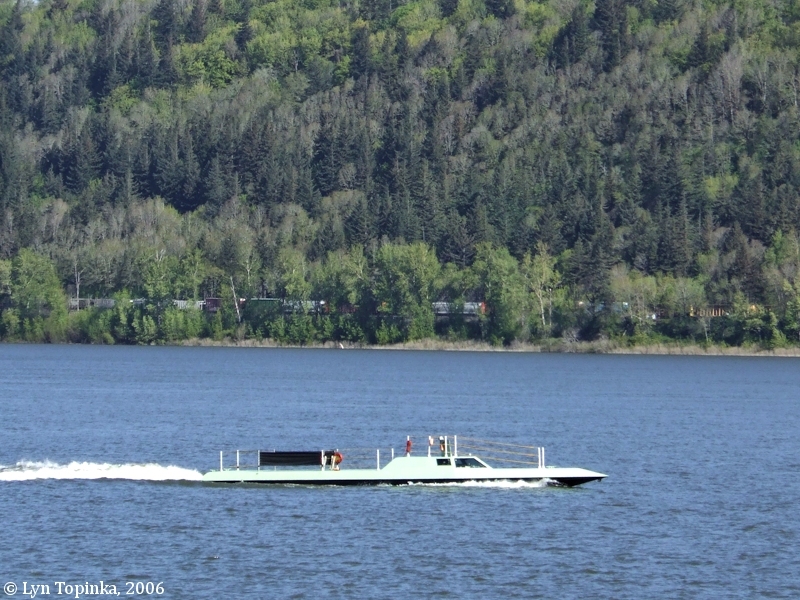 Click image to enlarge "Stealth boat" as seen from Rooster Rock State Park. Image taken April 24, 2006. 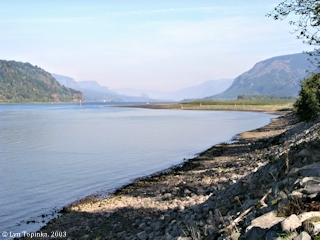 Click image to enlarge Columbia River upstream from Rooster Rock State Park, Oregon. Columbia River, looking upstream from Rooster Rock State Park, with Cape Horn and Beacon Rock, Washington, visible in the distance. Image taken October 18, 2003. 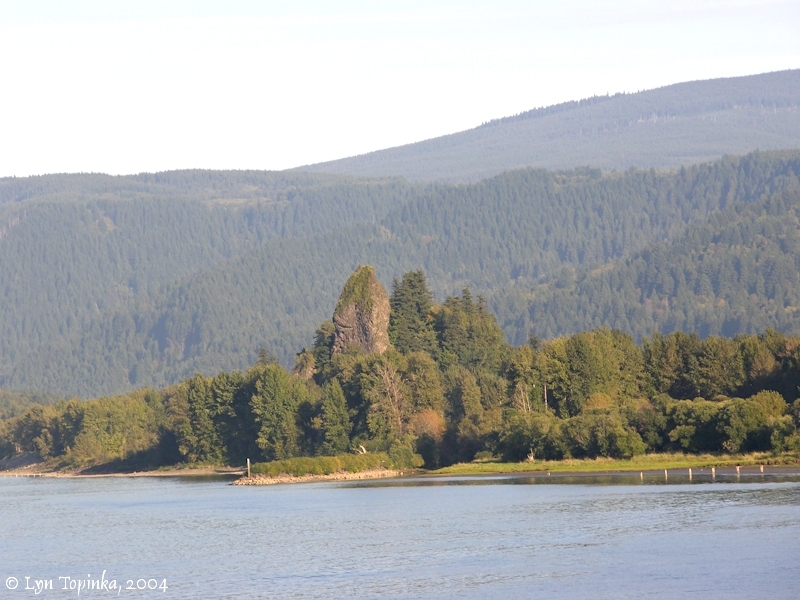 Click image to enlarge Rooster Rock State Park, Oregon, with Cape Horn, Washington. Image taken November 4, 2004. Click image to enlarge Rooster Rock State Park, Oregon, beach. Hikers along the beach of Rooster Rock State Park, Oregon, with the banks of Washington State in the background. Image taken October 18, 2003. 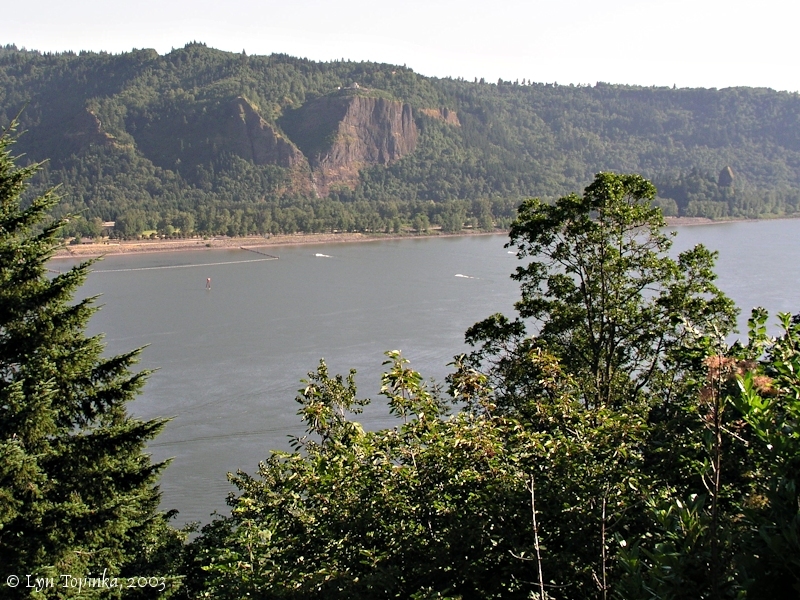 Click image to enlarge Rooster Rock State Park, Oregon, with Beacon Rock, Washington. Image taken November 4, 2004. Click image to enlarge Columbia River downstream from Rooster Rock State Park, Oregon. 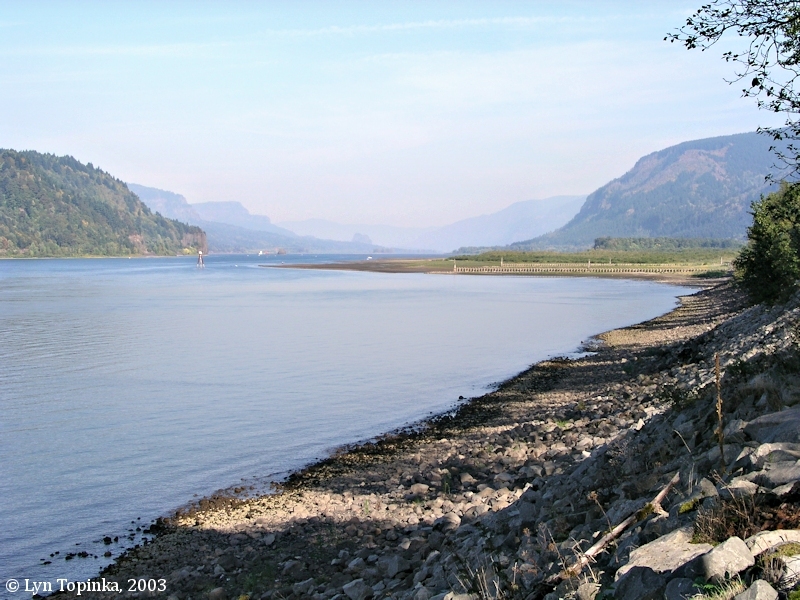 Columbia River, looking downstream from Rooster Rock State Park, with Point Vancouver and Steigerwald Lake refuge in the background. Image taken October 18, 2003. Click image to enlarge Crown Point, Oregon. View from Rooster Rock State Park, Oregon. Image taken April 24, 2006. Click image to enlarge Ice-covered jetty below Rooster Rock State Park, Oregon. Image taken January 15, 2007. The early 1900s was the "Golden Age of Postcards", with the "Penny Postcard" being a popular way to send greetings to family and friends. Rooster Rock was a popular image for the cards. Click image to enlarge Penny Postcard: Rooster Rock with Rooster Rock Cannery, ca.1910. Penny Postcard, ca.1910, "Rooster Rock, Columbia River". Rooster Rock, Oregon, with the Rooster Rock Cannery. Published by Louis Scheiner, Portland, Oregon. Postcard has postmark of 1916. In the private collection of Lyn Topinka. Click image to enlarge Penny Postcard: Rooster Rock and Crown Point, with Rooster Rock Cannery, ca.1920. Penny Postcard, ca.1920, "Columbia River Gorge, Columbia River Highway 25 miles east of Portland. Seen from Union Pacific System Trains." 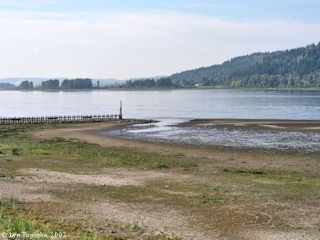 View shows Rooster Rock and Crown Point, Oregon, with the Rooster Rock Cannery. Union Pacific System Pictorial Post Card, "The Scenic Columbia River Route to the Pacific Northwest". In the private collection of Lyn Topinka. Click image to enlarge Penny Postcard: Rooster Rock, Oregon, and Steamer, Postmarked 1908. Penny Postcard, Postmarked 1908, "Rooster Rock, Columbia River, seen from O.R. & N. train.". Published for the J.K. Gill Co., Portland, Ore., by M. R., Los Angeles. Card #4020. Postcard has postmark of 1908. In the private collection of Lyn Topinka. Click image to enlarge Penny Postcard: Rooster Rock, Oregon, with Train Tracks, Postmarked 1914. Penny Postcard, Postmarked 1914, "Rooster Rock, Columbia River." Published by Patton Post Card Co., Salem, Oregon. Card is postmarked October 4, 1914. In the private collection of Lyn Topinka. S. 50° W. 5 miles to a timbered bottom on the Lard. Side, passed the Lowr. point of Strawbery Isd. at 3 miles [Hamilton Island], a Isd Covd with wood below on Stard. Side a remarkable high rock on Stard. [Beacon Rock] Side about 800 feet high & 400 yds round, the Beaten Rock. The mountains and bottoms thickly timbered with Pine Spruce Cotton and a kind of maple Passed 2 Small wooded Islands on Std. Side [today Ives and Pierce Island], <opsd> below the lower Island on the Stard. Side at 4 miles an Indian village of 9 Houses. The river wider and bottoms more extencive. "This morning we had the dryed meat secured in skins and the canoes loaded; we took breakfast and departed at 9 A. M. we continued up the N. side of the river nearly to the place at which we had encamped on the 3rd of Nov. [in error ?? ?, Lewis and Clark's camp of November 3, 1805 was on the north side of Government Island, downstream of the location they just spent 6 days at -- Cottonwood Beach. Most likely Lewis means the location of their camp of November 2, 1805, near Rooster Rock] when we passed the river to the south side in quest of the hunters we had sent up yesterday and the day before. from the appearance of a rock [Rooster Rock] near which we had encamped on the 3rd of November [November 2, 1805] last I could judge better of the rise of the water than I could at any point below. I think the flood of this spring has been about 12 feet higher than it was at that time; the river is here about 1½ miles wide; it's general width from the beacon rock [Beacon Rock] which may be esteemed the head of tide water, to the marshey islands [in the lower Columbia River Estuary, near Cathlamet Bay] is from one to 2 miles tho' in many places it is still wider. it is only in the fall of the year when the river is low that the tides are persceptable as high as the beacon rock [Beacon Rock]. this remarkable rock which stands on the North shore of the river is unconnected with the hills and rises to the hight of seven hundred feet; it has some pine or reather fir timber on it's nothern side, the southern is a precipice of it's whole hight. it rises to a very sharp point and is visible for 20 miles below on the river. at the distance of ten miles from our encampment [Cottonwood Beach ??? ... Rooster Rock ???] we met with our hunters in the upper end of the bottom [Shepperds Dell] to which we had directed them on the South side of the river. they had killed three Elk this morning and wounded two others so badly that they expected to get them. we therefore determined to encamp for the evening at this place [Shepperds Dell] in order to dry the meat, in surch of which we sent a party immediately and employed others in preparing scaffoalds and collecting firewood &c against their return." Riddell, H.H., 1916, "The Lesser Waterfalls Along the Columbia", IN: Mazama, vol.5.